Whilst enjoying a relaxing break, explore our award winning local restaurants and wineries, potter around the art, craft and antique shops or take a walk along some of our spectacular beaches nearby. The infamous Berry Country Fair takes place on the 1st Sunday of the month (excepting February when it is the 2nd), the Shoalhaven Wine Festival occurs on the June long weekend and the Berry Open Garden festival in October. 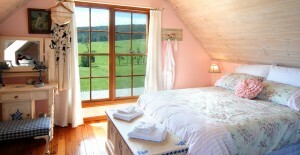 This picturesque cottage is situated on our five- acre property “Paradwys” – which is Welsh for “paradise”. The setting is rural but not remote with the townships of Berry, Shoalhaven Heads, Gerringong and Nowra within 10 -15 minutes. Branwens Retreat provides two-bedroom self-contained accommodation for up to six guests. A comfortable open plan living/dining/kitchen area, large verandahs, and an outdoor Jacuzzi Spa where couples or friends can sip cocktails while watching the sunset. The Rose Room – This huge (40 sq.m) upper storey bedroom has been designed for a couple or up to 4 guests happy to share. Queen size bed, two dormer window day beds and one single bed. Furnished with a shabby chic country look with lots of amazing views to the nearby mountains, winery and Olive groves. 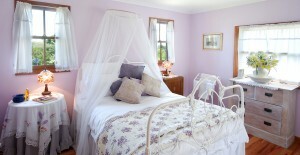 The Lavender Room – Suitable for a couple or single. Antique ornate cast iron double bed, lots of fresh white linen & lace. Situated on the ground floor this room enjoys picturesque views over the fragrant cottage gardens. High quality cotton bed linen provided in both rooms. Two person spa-bath, large shower cubicle, lavatory and vanity. Complimentary hand crafted lavender body care products for your sampling. Hair dryer, foot and hand spas also provided. Well equipped kitchen including stainless steel multi-fuel stove, dishwasher and capuccino machine. There are plenty of gadgets to assist you “cooking up a storm” so you can enjoy a gourmet meal whilst overlooking the valley. The open plan living room offers expansive views over rollng hills and mountains facilities include: suround sound music system, CD Player, DVD Player, LCD Screen TV. Outdoors you will find: Verandah seating, Dining Setting, BBQ & Garden Furniture and delighful cottage gardens. A candle lit patio houses the five person Jacuzzi Spa. It’s the ideal place to catch the amazing sunsets – whilst sippping your favourite cocktail.